Rockman Corner: Iwamoto Fan? You Could Win a D-Arts X Comic Version! Iwamoto Fan? You Could Win a D-Arts X Comic Version! Our friends at The Mega Man Network have kicked off a pretty tantalizingly contest for fans of Yoshihiro Iwamoto’s Rockman X manga. Simply prove your Mega Man mastery, and you could win an honorary, free Rockman X “Comic Version” figure! "You make whatever you want to show tribute to Yoshihiro Iwamoto’s Rockman X manga. It can be artwork, or a comic, or a video; anything you like! It simply must reference the manga. Show your fandom to win! You have until February 5th at midnight, PST to send us your entry, so get to it!" By and large, this is a tribute contest, so you're free to whip up anything that best represents your passion for the Blue Bomber. Paintings, sculptures, cosplay; leave no stone unturned! This is your time to shine! Hit the above link for full contest rules and regulations. Best of luck, everyone! Should time allow, I might go ahead and join in myself! Man, I wish there was something more interesting with Megaman, lately the biggest stories have been about manga and toys. only until feb 5? dont we need more time than this? Okay, no, what's wrong with you people? This is a very cool contest. Why is it everyone has to wail on this here, but not on TMMN? 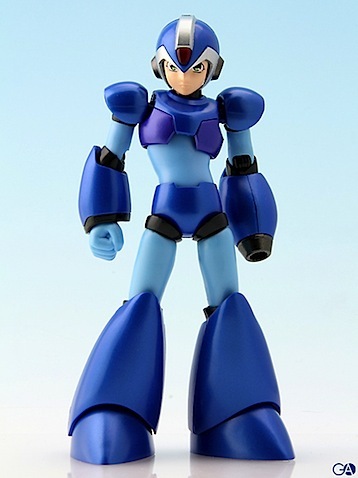 At least giveaway a D Arts MegaMan people want. Nobody wants the crummy manga MMX lol. Are you guys kidding me? This is a STEAL. You can't find this for less than $80 dollars. You should be ashamed, anon above me. Jimb0, I agree with you, but you can't find the regular X at any price! @Anon4: Has it ever occurred to you that the people who read protodude are fans of, you know, the GAMES? New toy you don't care about! New comics you probably won't read! More stuff on things gamers really don't care about! Oh, and Capcom's done their monthly snub against you guys again! That's what we see. We don't care at all about something that'll sit on our shelf and rot. We're not big comic book fans. WE ARE GAMERS. And we want news... ABOUT GAMES. Is that so hard to imagine? What's wrong with you people and your lack of understanding? Role, your a idiot. There are a ton of mega man fans that like the games and collect the figures as well, not every mega man fan hates reading about mega man merchandise so get over yourself. It's not like capcom is making any new mega man games so what else is there to post news about? Read the bit under the page banner. Don't go talking about lack of understanding. This is a pretty cool contest and people need to get it trough their thick skulls that things like this are what make franchises big. The more attention the blue bomber receives by any medium, the more likely Capcom decides it worth to make another game. I believe that what YOU fail to understand is that you don't write this awesome Rockman blog. Yes, gamers want news, but gamers would also appreciate what is going on in the world with their favorite blue robot, because games isn't the ONLY f***ing thing Rockman is in. Maybe not every gamer who reads this blog may seek out that comic, or this eBay item, or those toys that have to do with Rockman. But some might, and it will make *somebody's* day a little brighter for knowing about these things, even if they're not exactly able to obtain these items. Rockman is kept alive in many more items than just video games. Is that so hard for you to imagine? @Role: And what's wrong with you not understanding that not everyone thinks like you? Speak for yourself man, this is Protodude's blog and he can post whatever news/trivia/etc he wants, deal with it. Wow, it sure is unpleasable fanbase in here. Thanks for the heads-up, P-Dudey; that's a cool contest. Is the contest open for any region? The same person can send multiple entries? Okay, what Role said was wrong, but I think anyone who's an actual Mega Man/Rockman fan can say it's completely understandable to see someone else voice their frustration at the lack of games presently. I don't think that warrants multiple posters flaming the same person for technicalities when I'm sure all of you understand where he's(she's?) coming from. Yes, Mega Man appears in many forms of merchandise, but first and foremost he is a game. And also, he was not attacking Protodude at all. If anything, he was implicitly attacking Capcom for lack of any Mega Man gaming news. Well...to be on topic, I actually would much rather prefer an original D-arts, but eh. Good luck to whoever's entering. We don't care at all about something that'll sit on our shelf and rot. @Everyone's reaction: I am well aware that the site includes everything about rockman. I'm saying that most of the people complaining are primarily Gamers, and don't care for the other stuff. Which is not untrue. If you're not complaining, you probably like this stuff. If you are, you're like me, and generally don't care about the merchandise. It's a fun extra, but it's not what defines you as a Rockman fan - the games do that. The higher rate of complainers here would signify a higher readership of people who don't care about the merchandise her compared to the other sites. Stop whining about us and understand that we're pretty frustrated. We'd love any news period when it comes to what WE love - the games. But we've not got anything but bad news or no news for quite some time, and it's disheartening. So you like the toys. Good for you. But I prefer something that won't just stand on my shelf and look pretty, and I'm sure there's plenty of other people like that here too. I wasn't wrong in my statement - the readership here probably does have a higher percentage of people like me. I didn't say anything against the blog itself, but rather pointed out the readership demographics here. Once again role, get over yourself. Your arrogance is just pathetic, quit talking like you represent all mega man fans when in reality it's just your opinion. You don't represent the whole mega man fanbase. @Previous anon: Once again, you assume things. I do NOT represent anyone, I'm merely pointing out observations. Get over yourself and your belief that you know what everyone else thinks. It's not arrogance, buddy. This is me trying to explain WHY many people are so upset. Stop being so full of yourself and jumping to the defense of... what exactly? I'm just curious, what exactly are you defending here? People complain for a very valid reason, they get bitched at, I jump to their defense and try to explain why they're complaining, and I'm the bad guy here? Stop being elitist and understand that there are people out there who don't care about a piece of plastic that'll sit on a shelf and look pretty, but would rather have a GAME to play.